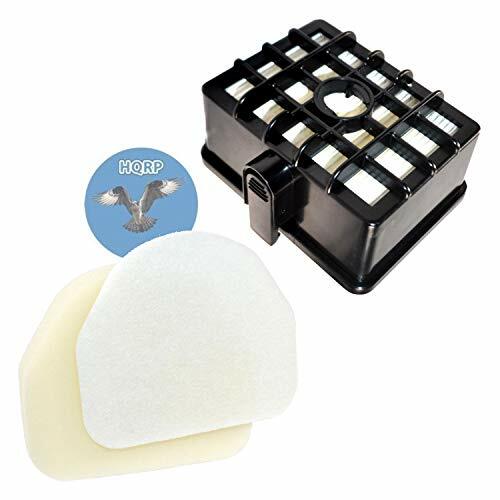 HQRP Replacement Filter Kit (HEPA + Foam & Felt) for your Shark Rotator / Rocket Vacuum Cleaner. Replaces Parts # XHF450 & XFF450. Compatible with: Shark Rotator Professional NV450, NV451 / Shark Rocket NV472, NV480, NV480C, NV480Q, NV480 26, NV481, NV482, NV484 Upright Vacuum Cleaners. Rinse and air dry the foam and felt filters every month, the HEPA filter once a year under normal use. Be sure all filters are completely dry before placing back into your vacuum. Do not operate the vacuum with wet filters! !!! PLEASE NOTE: Make sure you choose the right HEPA filter size! Some Shark vacuum cleaners NV450 / NV480 series (manufactured after 3/8/2013) need a different HEPA Filter - part # XHEPA450 (height - 2.75"). You can see manufactured date on the metal prongs of the electric plug. The height of our filter is 2.36 inches. So check the dimensions on your old filter to make sure they match. NOTE : PLEASE MAKE SURE THAT YOUR ORIGINAL HEPA FILTER HAS THE SAME HEIGHT AS OURS - 2.36 inches. Washable and Reusable; 2 weeks DOA replacement warranty!